Conan... does a barrel roll! 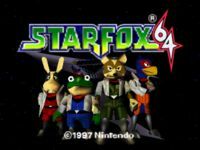 The Barrel Roll fad comes from the 1997 Nintendo flying simulator/space combat game Starfox 64. It came from a phrase that one of the character's main wingmen, Peppy Hare, repeated throughout the game. The fad may have been started by members from the Life, Universe, and Everything board on GameFAQs. The fad was one of the earlier fads, and became popular quickly. Most sites would play around with his quote, putting it into various situations. The phrase is also used on a side note in other sites, assuming everyone knows the joke, such as Lex Luthor > Scientology, where the creator decided to put a "lol, barrel roll" talk bubble on a car because it was rolling away. Another example is Fat Batman gets on fire!, where Peppy is heard when batman stops, drops, and rolls. To barrel roll, press Z or R twice! Don't mess up that Arwing! The fad also reached British television on ITV's phone-in quiz show Quizmania where a prank caller posing as Brian Peppers repeatedly shouted out "Do a Barrel Roll!" to the host, much as DZK claimed to have shouted to Haley in his infamous song. In an early episode of Tom Green's online late night talk show he too was phoned with a "barrel roll" prank caller. The line was chosen as YTMND's favorite entry into the "Make Optimus Prime Speak" fan competition held for the 2007 Transformers movie, where the winning fan submitted line would be spoken by Optimus (voiced by original series actor Peter Cullen) in the movie. The line made the top ten and gained the highest votes. In the meantime, Hasbro also trademarked the name "Barrel Roll Blaster" for a series of new Transformer toys. This enraged many Transformer fans who threatened to hack YTMND for "ruining their movie", but many of the people who supported the "Barrel Roll" entry were either Transfans who did not take the series as seriously as they did, or people who didn't like the way the movie looked already, nor the fact that it was being directed by Michael Bay. Despite winning the vote, the line was not picked for the movie as the winner or one of the other 9 runner-ups. The winner, for those interested, was "Freedom is the right of all sentient beings". This page was last modified on April 19, 2012, at 07:12. This page has been accessed 134,237 times.